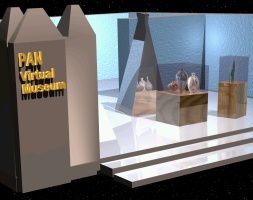 Step into the world of the virtual museum, where you can view hitherto unpublished objects in international private collections. Click on the small images of objects to see the larger version. You are invited to send us images of objects in your collection that you have studied and found to be both unpublished and important. Send us any information you have learned about these items, and we will publish it along with the images. If you prefer not to be identified, we will publish the items as from a "private collection." To start off the museum, one private collector has selected a few items from his own collection of ancient Celtic artifacts. All images of artifacts in this museum are copyright-free: they are in the common domain, and can be downloaded and used as you see fit. This does not apply to the images of the museum or other Pan images. 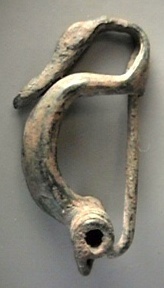 La Tène 1a fibula, circa 475-400 B.C. Unprovenanced. Workshop near Witry-lés-Reims, Marne. 3 cm X 5.5 cm, bronze. The swan has an extensive mythological history and survived in Greece in association with Zeus (originally a northern sky god). In Scotland, it was the bird of Brigit, who was later conflated with Mary. Compare with almost identical fibula from Witry-lés-Reims (La Tène I en Champagne, Bretz-Mahler 1971. p. 17f. Pl. 1.2). A miniature "terret ring," with punch or stipple decoration within engraved lines in Sword sub-style. 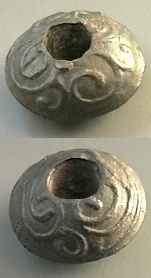 2.5 cm X 2 cm, bronze. In the trade, the majority of objects of this design are claimed to be only from circa 50 B.C. - 50 A.D. 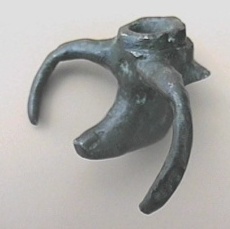 This ring is circa 200 B.C., by the style of its decoration, indications from the fabric, and the style of the form itself, which is in keeping with other objects of this date. 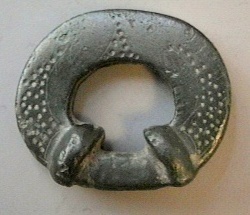 Since a terret ring is the ring holding the reins on a chariot yoke, this object would be too small for that function. These have often been thought to be votive objects, and, while many miniature objects are made for this use, unlike a Swan brooch, for example, there is no mythological connection with a terret ring. This is probably a functional object, such as a strap-ring or strap-end. The spindle whorl is unprovenanced; dealer's provenance of Norfolk is almost certainly false. Compare with plain lead spindle whorl (Bulleid & Gray, Glastonbury Lake Village, 1911, I. pl. XLV, L13). Standlake Scabbard (Oxon) early 3rd century B.C. (Cunliffe, Iron Age communities in Britain, 1976 p. 303 Pl. 15). Wisbeck Scabbard (Cambs) circa 300 B.C. (Fox, Pattern and Purpose, 1958 p. 1, fig. 2, Cunliffe, op cit., 1976 p. 303 Pl. 18). Involuted Brooches, Woodeaton and Beckley (Oxon) middle 3rd into 2nd century B.C. (Hull & Hawkes, Corpus of ancient brooches in Britain: pre-Roman bow brooches, 1987 p. 157 Pl. 47). Yr. spindle-whorl seems an excellent piece. I know of no elaborately decorated lead spindle-whorl of this type, though plain ones of the type were in use at Glastonbury, as you have probably already noted (Glastonbury Lake Village I, pl. XLV, L13), and lead was an Iron Age commodity of this area (ie from Mendip). -- ie a pre-Roman Iron Age native tradition. The mid-rib round the body suggests it was produced in a 2-piece clay mould (as also the Glastonbury piece), with the ornament done by pressing a model into the soft clay. The ornament on yr. piece seems rather dishevelled from canonical, but a good example of its class. It would be of great value to know where it did come from -- presumably from the Somerset area or not too far away. (ie east into Wessex). There are of course many other decorated spindle-whorls -- in stone, slate, baked clay &c, but the decoration is usually incised line & very simple; yours is quite out of the ordinary domestic run. E. M. Jope, "The Beginnings of La Téne Ornamental Style in the British Isles," in Problems of the Iron Age in Southern Britain, ed. S. S. Frere, 1960. Compare Wandsworth oval shield boss (Fox, Pattern and Purpose, 1958 Pl. 14 p. 26). Cow's head bucket mount, which would have been mounted where the handle meets the bucket (probably a milking bucket). 4 cm wide X 2.5 cm deep X 2 cm high, bronze. The animal appears to be Bos Primigens, a kind of long-horned cattle apparently unrecorded as a Celtic breed. Note the distinctive deeply-dished face of the animal. Other bucket mounts show short-horn cattle. 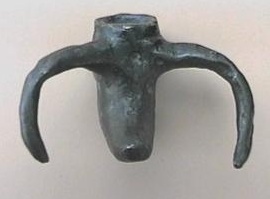 This object, showing an older breed of cattle, is probably earlier. Another thing that argues for an early date is the fact that, unlike other bucket mounts, this one looks up at the user. This is a distinctive early Celtic philosophy of design, where the wearer or user is seen as the primary audience. The Celts made objects beautiful for their own pleasure, not to impress others. An example of this is the Torrs Pony Cap, where the design makes little sense to an observer, but from the top, where the rider would look down, the foreshortened design is perfectly harmonic. This bucket mount is a little masterpiece of Celtic art, unequalled in its simplicity, liveliness, and form. It brings to mind Picasso's Bull's head, which he constructed from a bicycle seat and handlebars. There is the same breathtaking reduction of a design to its essentials.